This is a partial accounting. It will be updated as we gather and verify more of the historical record about the many efforts and events that have woven together the lives of US and Iraqi Dominicans. UN Sanctions against Iraq imposed, four days after Iraq’s invasion of Kuwait. Dominican Sisters International establishes as a vehicle for developing relationships among Dominican Sisters around the globe. Sister Marie Therese Hanna, then-prioress general of the Dominican Sisters of St. Catharine of Sienna, Mosul, is present at the founding event. Sister Margaret Galiardi hears fr. Timothy’s words and is moved to stand in solidarity with our Iraqi Dominican Family. Clinton administration’s 4-day bombing campaign against the people of Iraq. U.S. Dominicans join national effort to alert lawmakers about the devastating effects of 10 years of UN sanctions against Iraq by shipping boxes approximating an Iraqi family’s monthly food ration to members of Congress. Terrorists fly airplanes into the World Trade Center and the Pentagon. A passenger plane forced toward Washington DC is downed by passengers to prevent its use as a weapon against others. Nearly 3,000 people die in the incidents. Participants at the Dominican Leadership Conference in Adrian, Mich., learn that the U.S. began its air war against Afghanistan. It is the Dominican Feast of the Holy Rosary, a commemoration of Europe’s victory over the Ottoman Empire in a sea battle at Lepanto in 1571. “I Have Family in Iraq” become the words US Dominicans choose to express their solidarity with their Iraqi sisters and brothers. It was the inspiration of Sister Toni Harris, OP (Sinsinawa). She arranges for the design of buttons and bumper stickers. Iraqi Dominican Sisters Luma Khudher and Rihab Mousa arrive at O’Hare Airport to begin living and studying among their U.S. counterparts in Springfield, Ill.
U.S. Dominicans Jane Abell (Houston), Jim Barnett (Central), Brian Pierce (Southern) and friend Sheila Provencher begin a 28-day water-only fast in New York City’s Union Square declaring “There must be another way” to resolve conflict. Reflections by the fasters. Iraq Peace Journey, a delegation that includes Catholic justice leaders from around the U.S., is organized by Rick McDowell, who has accompanied the three previous Voices for Veritas Delegations, and his wife Mary Trotochaud. Among the delegates are Sister Beth Murphy, OP (Springfield), Sister Simone Campbell, and Maryknoll Father Roy Bourgeois. The delegates read this statement, which is translated into Arabic for the congregation, at St. Joseph Chaldean Church, Baghdad, on Dec. 18. Sister Sherine Hanoosh Panoor, OP (Mosul) and Sister Beth Murphy invited to World Social Forum in Porto Alegre, Brazil. Sister Sherine speaks against the injustices of U.S. and UN policy toward Iraq before an international audience of 7,000. She receives a standing ovation. 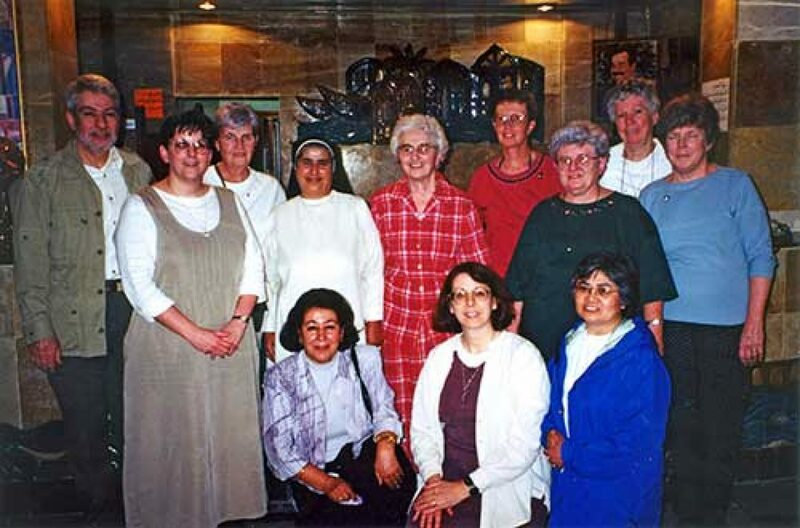 Sisters and Friars who have visited Iraq, in conjunction with justice promoters and hundreds of other Dominicans and their friends, are tireless in their efforts to “speak truth to power” by advocating for peaceful resolution to the war and its impact on Iraqi families. The source of their authority is their relationships with people who know the reality on the ground in Iraq: the Iraqi Dominican Family. Sister Roberta Popara, OP (Sinsinawa) and Sister Beth Murphy spend these days with our family in Iraq visiting Baghdad, Mosul, Qaraqosh, Dohuk, and many of the villages on Nineveh Plain. On New Year’s Eve US Dominican friars Jim Barnett and Richard Woods of the central Province, traveled to Iraq with then-French Provincial fr. Bruno Cadore to be present for the ordination in Qaraqosh of fr. Hani Daniel. Three members of the Iraq congregation arrive in Adrian, Mich., for an extended period of study and ministry: Sisters Nadiya Shamees, Aman Miriam Mansoor, Zena Qeryaqozo. Sister Dianna Momeka, OP (Mosul) arrives in Detroit. Sister Beth Murphy works for Refugee Services Office of the Archdiocese of Detroit to resettle Iraqi refugees. She volunteers at St.Toma Syriac Catholic Church, extending and deepening the bonds between U.S. and Iraqi Dominicans as she welcomes innumerable Iraqis who have ties of blood and affection with the Dominicans in Iraq. Sisters Ban Saeed, OP, and Sister Maryan Khume also join the sisters in Adrian. Sister Beth Murphy is invited by Father Jean-Jacques Perennes to join the friars who serve in the Arab world at their triennial conference in Erbil. She stays for two weeks with the sisters in Erbil, in a large newly built convent. In 2014 this house becomes the de facto center house for the congregation during the exodus from Nineveh Plain forced by ISIS. ISIS seizes Mosul, declares a “caliphate” in Iraq and Syria. Tens of thousands of religious minorities in the territory flee the region, including Dominican Sisters. Kurdish Peshmerga that had been providing security for Qaraqosh and other villages on Nineveh Plain pull back to defend Erbil as ISIS advances. By midnight the sisters have made the decision to flee, along with virtually every other resident of the towns where they live. The normal one-hour trip from Qaraqosh stretches to more than a 12-hour journey among roads clogged with vehicles and people on foot seeking refuge in the relative security of Iraqi Kurdistan. A US-led coalition begins a bombing campaign against ISIS in northern Iraq. Now IDPs themselves, the sisters work collaboratively with the clergy and various NGOs to minister among the displaced, providing clothing and food, organizing common kitchens, and eventually establishing schools, serving in clinics, and attending to many other physical and spiritual needs of the people. Three US Dominican Sisters, Durstyne Farnan (Sinsinawa) Arlene Flaherty (Blauvelt), and Marcelline Koch (Springfield) travel to Erbil in solidarity with the displaced persons of Iraq. They were met there by Dominican friars Brian Pierce and Timothy Radcliffe who also visited Baghdad. Sister Nadiya Shamees, OP, visits the Adrian Dominicans. In a video interview she speaks about her ministry at the sisters’ maternity hospital in Baghdad. Sister Habiba Behnam Toma, OP, arrives in Springfield for a sabbatical year with the Springfield Dominican Sisters, just as a coalition of Iraqi government and Kurdish Peshmerga begin offensive against ISIS in Mosul. During the year Sister Habiba speaks to audiences in Illinois and throughout the Midwest about living conditions in refugee camps throughout Kurdish-controlled Iraq. Iraqi Prime Minister Haider al-Abadi declares victory over ISIS in Mosul. Throughout the summer, Iraqi Dominicans share news of returns to the villages. Some villages were barely damaged after three years of ISIS occupation, others were devastated and will take years to repair. Some families are determined to rebuild their homes, others find that squatters have moved in and have no homes to return to. Many Iraqis desire to leave Iraq forever, others are determined to stay. An Iraqi Jesuit brother seeks the permission of Sister Clara Nacy, prioress general, to reopen the sister’s school in order to teach the children of families returning to Qaraqosh. Two sisters join the staff of this ad hoc summer program, commuting between Erbil and Qaraqosh each day because their convent is in ruins. Sister Habiba, now back in Erbil, communicates that roads are closed between Erbil and Qaraqosh in preparation for the September 25 nonbiding referendum on Kurdish independence. Sisters Rose Anne Schlitt, Catherine Waters, and Gloria Escalona, who plan to travel in mid-October, await word of the outcome and pray for calm in the face of this new challenge to Iraqi sovereignty. Drawn by Love. A History of the Dominican Sisters of St. Catherine of Sienna, Mosul, Iraq. Marie Therese Hanna, OP, with Elise D. Garcia, OP; Nazik Khalid Matti, OP, eds., and Aman Miriam Mansoor, OP, translator. San Antonio, Texas: Sor Juana Press. 2010. Silencing the Prophets: The Media’s Truth-Telling Failure Before the US Invasion of Iraq. Beth Murphy, OP (2004). Dominican nuns in Iraq. Worldview interview with Sister Marcelline Koch, January 29, 2015. Reflective summary of events leading to the exodus from Nineveh Plain. Search globalsistersreport.org (Iraqi Dominicans) for many reports from 2014 to the present.